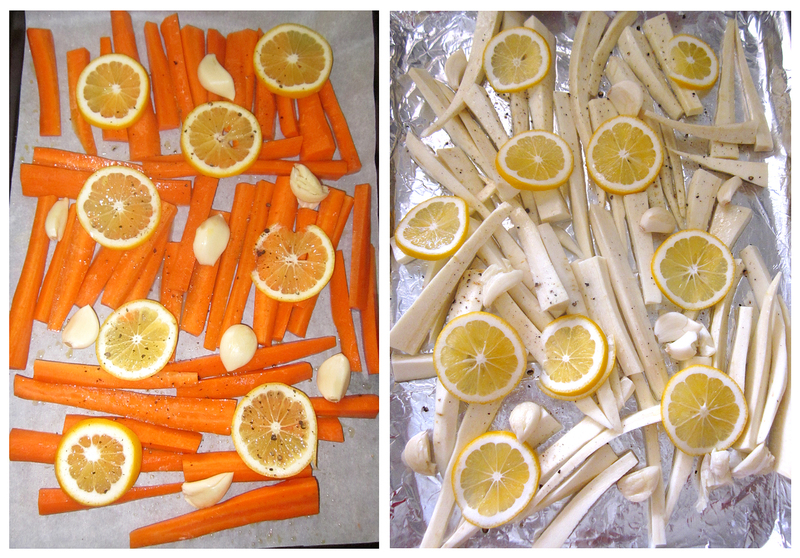 Prep is simple: root veggies are peeled, garlic cloves skinned but left whole, lemons sliced … all are tossed with olive oil and roasted in a single layer, then combined at the end. A quick topping of chopped flat-leaf parsley adds a bright herbal finish. You have to try this dish with roasted chicken. 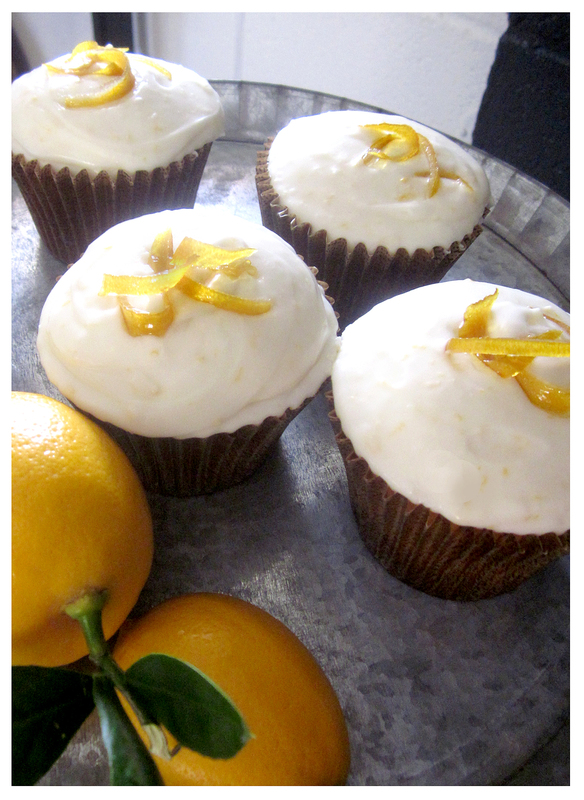 On the sweet side I decided that Meyer Lemon Cupcakes with Candied Lemon Zest (click here for recipe and tutorial) would be fun … and boy, were they. The cake part of the recipe, which included grated lemon zest, produced a mild lemon-flavored base with a delicate crumb. The frosting, however, amps up the lemon flavor by including both zest and fresh juice … I took things a step further by doubling the recommended amounts. I’m glad I did, too, because for me the final product was perfect: a classic cream cheese frosting now had a just-this-side-of-pucker-inducing lemon zing! Making the candied peel garnish was simple, too, and I loved the translucent — and super tangy — result. I used a large number of our lemons for these dishes, and gave an equal amount away to my sister … but the trees’s still resplendent with both buds and blooms, so more are one the way. Next harvest I plan on a Meyer lemon marmalade and a Moroccan chicken dish with lemons and olives … can’t wait! Totally worth it, but I had to send the extra cupcakes on their way to others… too good, too dangerous! I met a man with about 8 lbs. of apples at the market – he says he cuts them up and marinates them in fresh lemon juice?! Phew! For a minute I thought this might be a math class ‘word problem’! … I know placing cut apples in lemon juice will prevent them from turning brown … ? Maybe that’s what he was referring to … then he makes several pies? Was just going to make Marty his fave 12-lemon cake for Val Day, but have bumped that recipe to try these cupcakes. 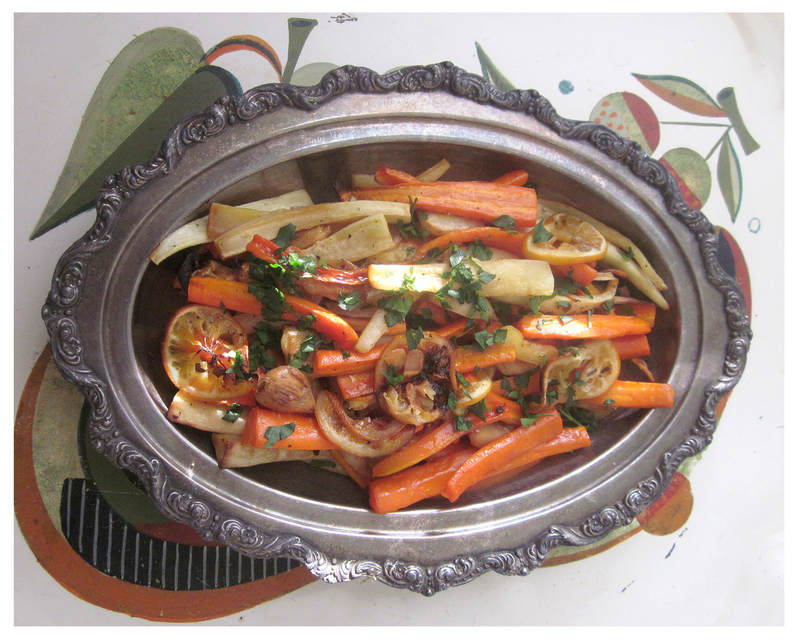 The root vegetable recipe goes into rotation this week as well. Thank you (and your lemon tree) for the inspiration! Parsnips!! Just roasted some the other day with beets and sweet potatoes…yum! I’ve been making lemon, lime and lemon-lime bars with all the citrus. And the little tangerine tree that could is bent over with its abundance. People across the country have been receiving those flat-rate PO boxes stuffed with Riverside citrus goodness! How delicious all of this sounds: Lemon-lime bars especially! Do this part just before you take the shortbread out so that the juice doesn’t “cook” the eggs! Note: Use a non-stick or pyrex baking pan. It’s not a pretty clean-up with that baked on sugar mess! Wow, sounds great, thanks Kim!